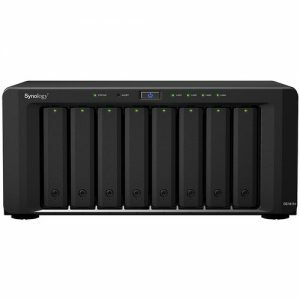 The DiskStation DS215j 2-Bay NAS Server from Synology is a data sharing, backup, multimedia streaming, and cloud synchronization solution that comes equipped with two drive bays that are each equipped with a 3TB hard drive, for a total storage capacity of 6TB. 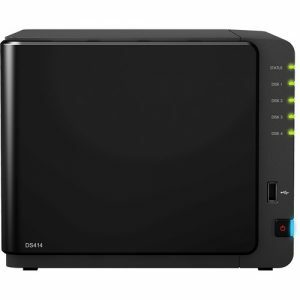 Using its dual drive bays, this NAS will allow you to store and share a large number of files, including videos, music, photos, and documents with up to 1,024 users. 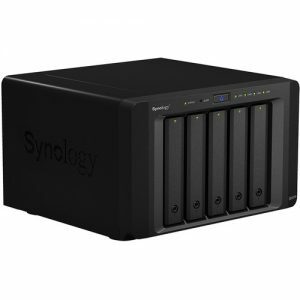 However, please bear in mind that the total capacity of this NAS will depend on its RAID configuration. 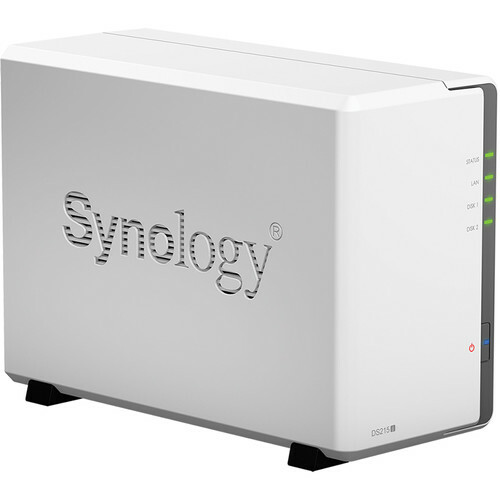 The DS215j runs on the Synology DiskStation Manager (DSM) OS, which is a browser-based operating system which helps to simplify managing your Synology NAS. Its CPU is an 800 MHz MARVELL Armada 375 88F6720 Dual-Core processor and its 512MB of DDR3 RAM allows frequently-used files and applications to be quickly accessed. The NAS is capable of achieving read speeds of over 111 MB/s, write speeds of over 87 MB/s, and features 1 x USB 3.0 port and 1 x USB 2.0 port which allow it to be connected to your Windows, Mac, or Linux system. Internet connectivity is achieved via the Gigabit Ethernet port, allowing your stored data to be shared with users throughout the network. Data may also be made remotely available through the free iOS and Android applications. Using the integrated media server on the DS215j, you have the ability to stream digital multimedia content from the DiskStation to media devices for local or remote playback. You may also stream movies and music to DLNA-compatible devices, such as TV’s or gaming consoles without any pre-configuration so that you may enjoy your favorite movies or shows stored on the DiskStation. 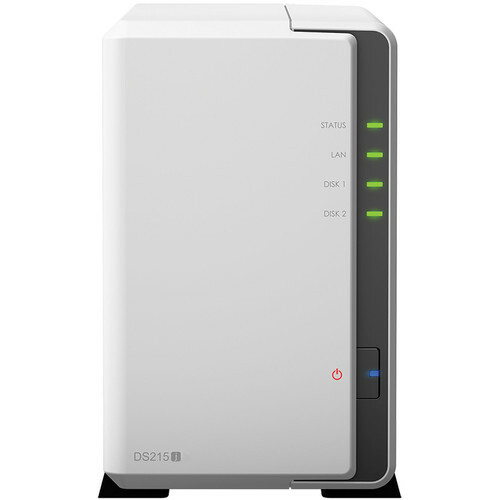 The DS215j also serves as a centralized backup target for all the computers in your home. 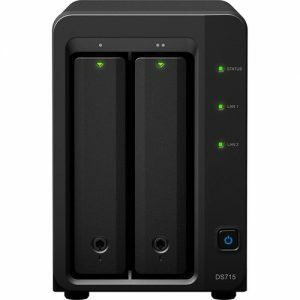 Windows and Mac users can back up data to the DS215j using Cloud Station, while Mac OS X users will be able to take advantage of native Apple Time Machine integration. You also have the ability to set the backup destination to not only be local hard disks, but also connected USB drives and public cloud services, such as Amazon S3, Amazon Glacier, Microsoft Azure, SFR, and hicloud. The DS215j is also engineered to be energy efficient. 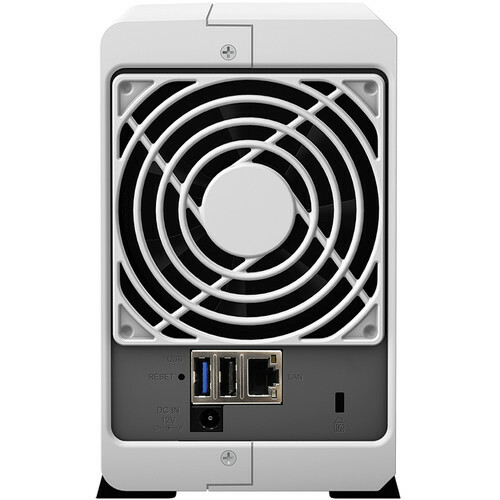 Not only does it offer a larger 92 x 92mm fan and smart airflow to help keep the system running cool at all times, its noise dampening design of 18.5 dB(A) makes for quiet operation. The server supports numerous scheduled power on / off cycles and hard drive hibernation to further minimize power consumption and operation expenses. The DS215j operates on 100-240VAC at 50/60 Hz (single phase) and includes an accessory pack, an AC Adapter, an AC power cord, and an Ethernet cable. 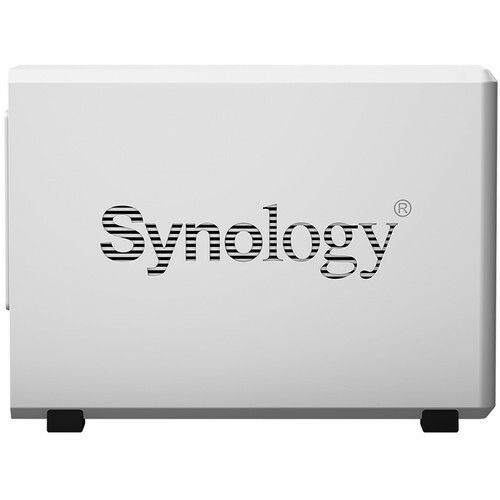 The DS215j brings you comprehensive cloud service. Cloud Station lets you sync files among DiskStations and multiple devices, including Windows PC, Mac, Linux, iOS, and Android, as well as Windows mobile devices, whereas 2-way sync allows file synchronization among different DiskStations. You can even sync files between Google Drive, Dropbox, and Baidu.